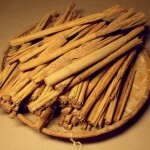 Around 200 species of cinnamon are found in the area covered by Southeast Asia, East Asia and the Pacific Islands. In the tertiary period their distribution was much larger. Occasionally cinnamon flowers are seen in Baltic amber! Cinnamons are fragrant. Leaves, bark, flowers, fruits, wood and root always contain essential oil of various composition. Cinnamon as we know it is the dried bark from the Sri Lanka cinnamon bush, C. zeylanicum. The main component of cinnamon bark oil is the aromatic aldehyde 3-phenyl-2(E)-propenal, also called cinnamaldehyde (about 60 % of the essential oil). 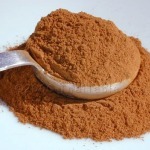 However, the oil from the leaves of the cinnamon bush has eugenol as the main component, the oil from the root has camphor as the main component, whereas the oil from the flowers has cinnamyl acetate as its main component  . Coca-Cola's original flavour came from cinnamon, lime oil, cola nuts, etc. Etymology: Gr. kinamomon, from kinein, roll; a, without; momon, error, i.e. an unbroken bark roll. Lat. zeylanicum, from Ceylon (Sri Lanka). The African civet (photo on the left) lives in savannahs and forests of South & Central Africa, ranging from Senegal to Somalia and south to Namibia and eastern South Africa. 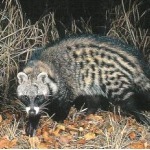 The Indian civet (photo on the right) ranges from Indochina to China. It can be found in the countries of Nepal, Bangladesh, the Malay peninsula, and Vietnam. 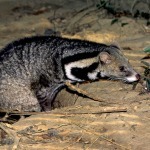 Both species produce the so-called civet, an oily substance secreted by the animals to mark their territory. Civet has a penetrating and strongly faecal smell of carnivore, partly due to skatole. On ageing and upon dilution, a pleasant animal-musky odour develops, highly valued in perfumery. For this reason the animals are kept in cages, and the fresh secretion is taken from the pouches at weekly intervals. It is said that King Solomon’s supply of musk came from East Africa. Fortunately, the animal musk trade has declined over the years due to the availability of modern synthetic musks of nature-identical or -similar character. Already in 1936, the famous Croatian-Swiss chemist Leo Ruzicka identified the most important musk compound in civet to be 9(Z)-cycloheptadecenone, also called civetone. Today this macrocyclic ketone is made industrially. It has a refined and very persistent animal-musky odour  . See also musk. The genus Salvia is probably the largest among the Labiatae. 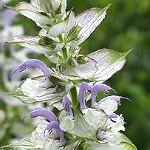 More than 700 species of Salvia are known from warm and temperate zones. 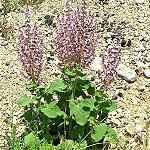 Clary sage, Salvia sclarea, is an erect herbaceous biennial, native to southern Europe and the Mediterranean region. The plant grows naturally in dry calcareous soils of high elevation. 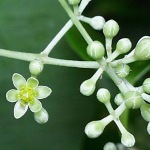 Reaching a height of 1 to 1.5 meters during flowering, the plant is characterized by broad-ovate, green, pubescent leaves, and variegated flowers of white and lilac. Its famous essential oil has been used in pomades and perfumes since old times. The odour is of a vinous lavender type with attractive ambery and leathery nuances. It is widely cultivated throughout the temperate regions of the world. Principal production centres include France, the USSR and Hungary, and USA. The essential oil is isolated by steam distillation of the flowering tops. Around 250 compounds are identified, the main constituents being (-)-linalyl acetate (67 %) and (-)-linalool (16 %). The ambergris-like nuances are due to oxidative degradation products of the diterpene sclareol, first of all (-)-ambrox. Sclareol is the main constituent (> 70 %) of the essential oil (concrete) made by extraction. It is commercially isolated as a starting compound for the synthesis of (-)-ambrox . See also garden sage. Etymology: Lat. salvare, to heal, Lat. sclarea, clear. The common name Clary, 'clear eye', comes from the folk medicine use of the plant's mucilaginous seeds to reduce inflammation of the eye. In Germany the plant is called Muskateller Salbei. It has been used as a flavoring in Muskatel wine. Cloves are the sun-dried flower-buds from this tropical tree of the myrtle family. They are grown in Madagascar, Zanzibar and Indonesia, and are a popular spice all over the world. 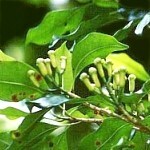 The fragrant buds contain about 20 % essential oil. Eugenol (ca. 80 %), eugenyl acetate and caryophyllene are the major constituents. 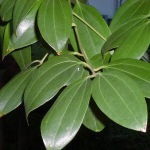 Eugenol is also present in the leaves, from where it is isolated by steam distillation and used as a starting material for the synthesis of several important compounds . 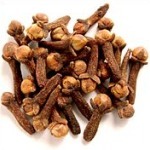 Moreover, it is used in perfumery because of its powerful and characteristic, 'spicy' clove odour. All members of the myrtle family contain essential oils, see also allspice and bay leaf. Etymology: The clove tree was formerly placed in the nearby genus Eugenia, as Eugenia caryophyllus. This genus was named after the Austrian prince Eugen (1663-1736), hence the name eugenol for 4-allyl-2-methoxyphenol. 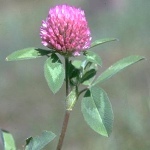 White and red clover are native to Europe, North Africa and western Asia. They are widely cultivated pasture crops and fodder-plants, valued for their nitrogen fixation by rhizobia, their high protein content, and as one of the main sources of nectar for honey-bees and bumble-bees. 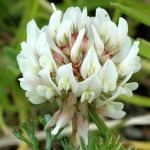 The mild sweet scent of blooming clovers is a charm of the summertime meadows. Buttery et al. investigated the volatiles from red clover flowers and found that they were dominated by acetophenone (24 %), methyl cinnamate (11 %), 1-phenylethanol (8 %), (E)-beta-ocimene (8 %) and (E)-2-hexenal (6 %) . Etymology: Lat. trifolium, threefold leaf. 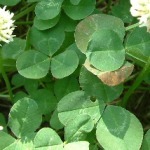 The clover leaf has several symbolic meanings, it is behind the clubs of playing cards, etc. Lat. repens, creeping; Lat. pratense, growing in the meadows.